I'm always looking for ways to make the desserts I serve a bit nutritious. 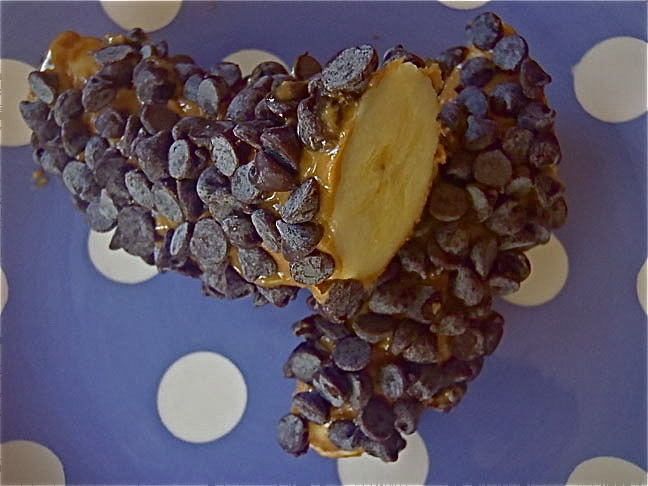 How about a healthy banana covered with protein-rich almond butter and a sprinkling of chocolate for good measure? I'm certainly not knocking apples, but a banana a day could also keep the doctor away! I've learned that a banana provides about two times as many carbohydrates as an apple, five times as much Vitamin A and iron, and about three times as much phosphorus — and of course, they're extremely rich in potassium! As you can see, your family can enjoy this yummy dessert, guilt-free. Why, it's almost a health food! Pour half of the mini-chocolate chips on a large plate and set aside. Peel the banana and evenly spread the almond butter over it. (It's easiest to do this while holding the tips of the banana.) Place the covered banana on top of the plate of chocolate chips and sprinkle the remaining chips on the top and sides. Gently press the chips to secure them. Put the plate in the freezer for at least an hour. Cut in half and you'll have two frosty banana treats! You can use any nut butter you'd like — peanut butter would undoubtedly be delicious! Sunflower seed butter is also great. Finely chopped nuts or granola would be a great alternative to the chocolate (not that anyone would forgo a bit of chocolate)! You could also combine the two. There's an idea! Yogurt Cereal Power BreakfastHaunted Eggs!